Peanut butter foldover. Banana. Boiled egg. It’s what’s for dinner… and lunch… and breakfast… and snacks. On Sunday, October 12, my SNAP Challenge came to an end. For the folks scoring at home, I had $27 to feed myself for the entire week: The same amount a single adult receives for a weekly food budget on the Supplemental Nutrition Assistance Program (also known as food stamps). That’s about $1.28 per cibum or $3.86 per diem. 1) Denial and Isolation: On Saturday when I unloaded my $27 worth of groceries, I smugly wondered: How am I going to eat all of this food? By myself? Seriously: A POUND of black beans, a whole head of cabbage, a 5-pound sack of potatoes, two boxes of spaghetti, eight chicken-thighs and 18 eggs. Eighteen! I didn’t even know what I’d eat first – the chicken or the eggs? I filled my crockpot to the brim with hearty, homemade black-bean soup. Parting it out into six massive servings, I figured I should just go ahead and freeze some since I’d probably be eating it for the next three weeks. Sure, I was light on the fresh fruits and vegetables, but still: $27 can buy a lot of food, especially with coupons. I got this in the bag (Actually it was three reusable bags). Make that pangs. Hunger pangs. 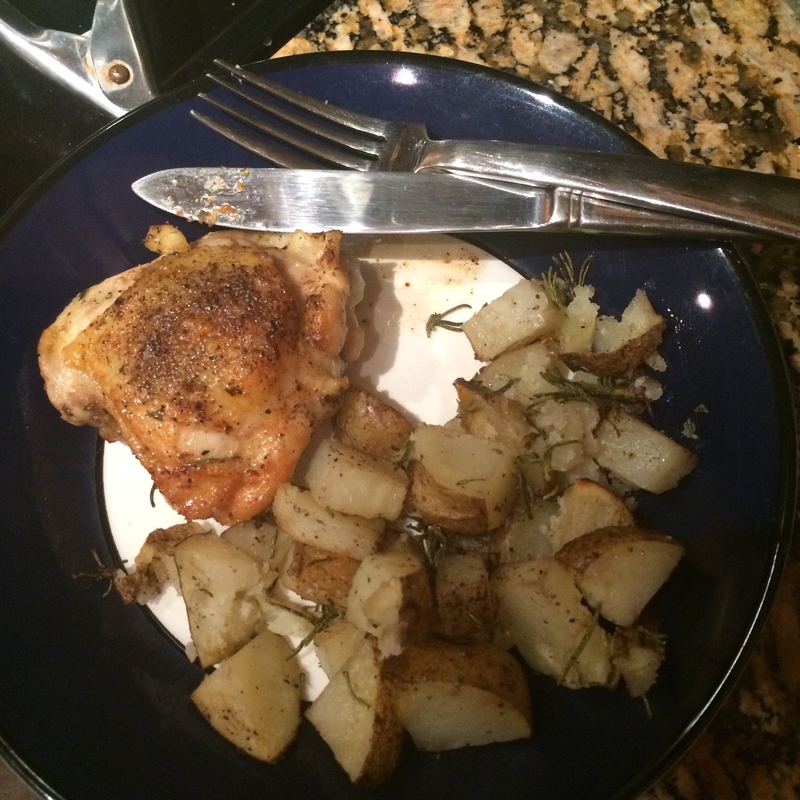 Chicken and potatoes. Brown: It’s what’s for dinner. I stumbled out of the gate on Opening Day of the Arizona SNAP Challenge. At 5:02 AM, I trudged into the kitchen. Made the coffee. Drank the coffee. Realized the coffee was not in my $27 weekly food budget. Talk about your wake-up call: When I went shopping on Saturday at my neighborhood Safeway, I thought only about what I’d be eating this week. It took me about an hour to spend $27… which is about as much time as it normally takes me to spend $270. 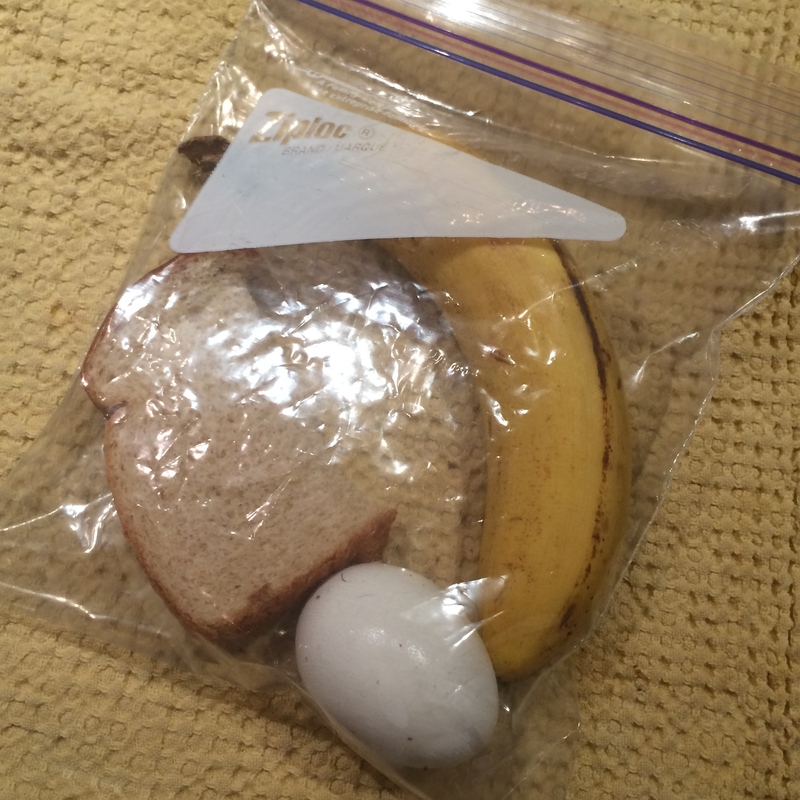 I kept adding (proteins, starches) and subtracting (fresh fruits, vegetables), trying to see into the future of servings that could stretch to next Monday. Thinking about how I’d be eating on $1.27 per meal, I never considered what I’d be drinking! Because you cannot use the Supplemental Nutritional Assistance Program (SNAP) to purchase alcohol, I knew I could abstain from booze for a week, but I hadn’t figured on skipping the one beverage I am truly addicted to: COFFEE. $29.06 doesn’t buy a lot, and I have to give the pears to Pat to fit under the $27 limit. Two 28-ounce cans of tomatoes. One 14.5-ounce can of sweet corn. A 1-pound sack of dried black beans. A 1-pound sack of brown rice. 3.95 pounds of chicken thighs. One 15-ounce jar of extra crunchy Skippy Natural Super-Chunk peanut butter (lower in sugar and fat). One gallon of 2% milk. One 5-pound sack of russet potatoes. One loaf of wheat bread. Two, 16-ounce boxes of Barilla pasta (Yes, I realize their chairman is a homophobe… but the pasta was on sale for 79 cents a box. We all have to make sacrifices). Grand total: $29.06. Damn you, Bartlett pears. I knew I shouldn’t have, but I wanted a little something extra in the fresh fruits-and-vegetables column. Suffice it to say, I’m giving those sweet treats to my sweet husband, Patrick, when I begin the 2014 Arizona SNAP Challenge on Monday. 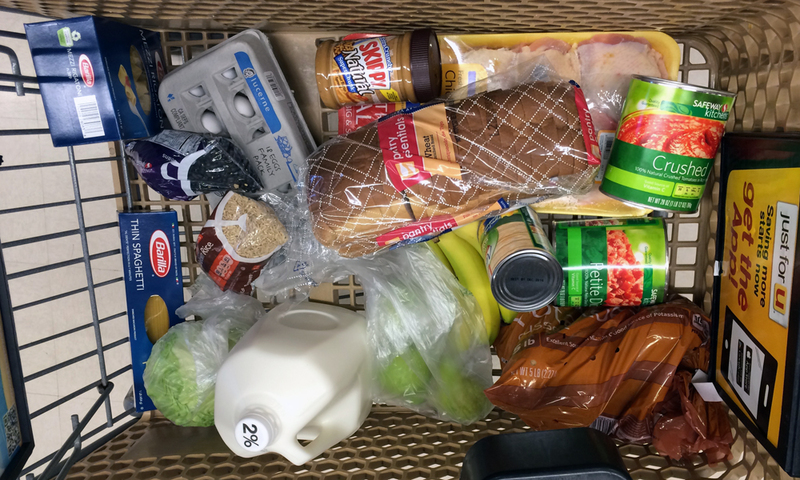 The goal of the SNAP Challenge is to live for one week on the same food budget of an Arizonan on the Supplemental Nutrition Assistance Program (SNAP), formerly known as “food stamps.” For a single person, that’s $27. Per hebdomadem, not per diem. I can easily spend $27 on a single meal – and this week, I have $1.28 per meal. Sadly, I could not persuade Patrick to join me on this journey in order to score a luxurious extra $18 on our food allowance.